In English conversation classes, one popular activity is "Find Someone Who". Often, these activites are copied out of resource books or created by the teacher; sometimes, they appear in communicative textbooks. These activities are easily extended to Captur activities. What Are "Find Someone Who" Activities? _______ has been to California. When they find someone whose answer fits the sentence, they write that person's name in the blank space. They can ask the questions in any order, but they should only talk with one person for a couple of minutes before moving on to another partner. Before students do the "Find Someone Who" activity, I use the Captur paddles to review the question structures that they'll need to use. For this first one, what question do you ask? They should all show you , the response for "Do you ____?" Yes, "Do you." Do you like spicy food? Students ask you the question in a chorus. You answer. Ask a student the question. Have one student ask you the question. You answer. Most "Find Someone Who" activity sheets have about ten or 12 questions on them, but it would be tedious to do this kind of warm up for every one of the questions. If students are consistently choosing the correct question form, then you know you can stop, and let them do the activity. However, if they're having trouble with it, you may have to review the reasons why we make these choices. 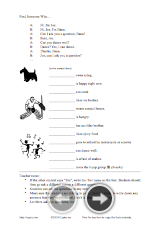 Please download our example activity sheet to use in your own classes, or as a model for creating your own version. In classes where students are generally friendly with each other, you can just let them mill about with their forms, asking whoever is available. However, in some classes, you could end up with students who hesitate to interact. In other classes, you may find that a group of students has formed in order to give each other fast answers. Don't let students write down any answers that they've overheard. The point of this activity is to have students asking and answering these questions on their own, to a large number of people. You could have them form a double line, talking with the person directly across from themselves. After a few minutes, you tell them to rotate: One person at the front of the line moves to the opposite line, and the person at the back of the second line moves to the first line, and all students move so that they're standing across from a new partner. Tip: In large classes, this can get confusing, so you could ask students to shake hands with their parter, or just say hello to their partner, to make sure that no students have been left without a partner.